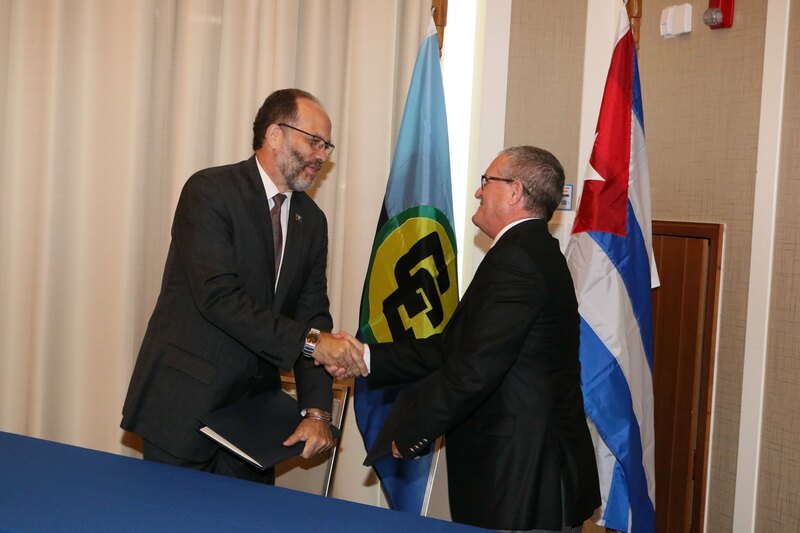 The Caribbean Community (CARICOM) and Cuba on Thursday signed the Second Protocol to an Agreement that will expand access to each other’s markets for goods. CARICOM Secretary-General, Ambassador Irwin LaRocque, and Cuban Ambassador to CARICOM, His Excellency Julio Cesar Gonzalez Marchante, signed the Second Protocol to the Trade and Economic Cooperation Agreement between CARICOM and Cuba during the opening of the 45th Meeting of the Council for Trade and Economic Development (COTED) in Georgetown, Guyana. Under the Second Protocol, Cuba will expand duty free access to more than 320 items including meat, fish, dairy products, fruits, vegetables, beer, rum, cement, soap and apparel. CARICOM will grant duty free access to some 50 items, including fish, pharmaceutical products, fertilisers and articles of iron and steel. The Community will also offer differentiated treatment on 22 items. The differentiated treatment includes phased reduction of duty by Most Developed Countries in CARICOM. The CARICOM Secretary-General said that signing the Second Protocol marked a further deepening of the trade and economic relations between CARICOM and Cuba and provided further opportunities for the Region’s private sector. (iv) harmonisation of technical and sanitary and phyto-sanitary measures. The Trade and Economic Cooperation Agreement has provided tremendous opportunities for the development and expansion of business.